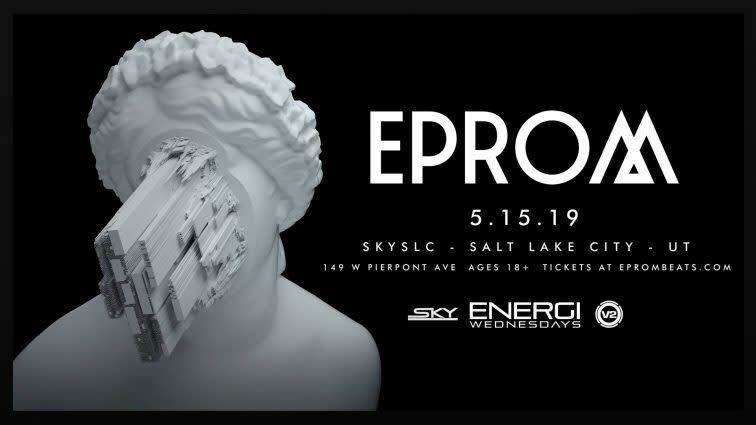 V2 Presents & Sky SLC present EPROM.We will be giving you that extra voltage off ENERGI you need every single Wednesday night in the form of dance music! 18+ will be dancing downstairs and we have a 21+ only area upstairs for you to enjoy a cocktail while you party. It’s time to connect our ENERGI and DANCEEprom has turned more than a few heads in his climb to the top of the bass music world. Eprom is one of the vibrant West-Coast scene’s most colourful characters, with an unmistakable sound and an unforgettable stage presence. His unique sound varies from toxic hip-hop to searing garage mutations to bizarre concoctions somewhere in between.Eprom’s Pineapple EP as well as his Acid Disk EP with G JONES has cemented him as one of the champions of underground. This success has not gone unnoticed, either. Fans and supporters of Eprom include Flying Lotus, ?uestlove, DJ Shadow, Diplo, Bassnectar, Craze, Rustie, and The Glitch Mob. In addition, Billboard recently announced Eprom as Billboard Dance’s Ones to Watch for July 2018.Eprom’s new project, “In Praise of Darkness”, a collaboration between Alix Perez and Eprom as “Shades” has been well worth the four-year wait. It’s a work that seems to combine nearly incompatible bass sounds, creating a journey through the album that will both surprise and astound you. It’s a mix of experimental sound design, crazy percussion and unpredictable switch-ups that characterize the entire album.Eprom has just begun his takeover of the underground world while causing a terror on the West-Coast beats scene. It is this undisputed musical mastery that makes Eprom an artist to keep an eye on in the future.